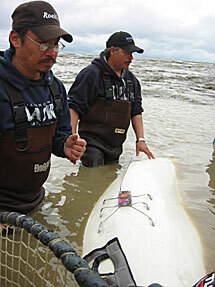 A satellite tagging study to determine year-round movements and important areas for belugas in Bristol Bay. A health assessment study to obtain baseline parameters for a known healthy and growing wild population. 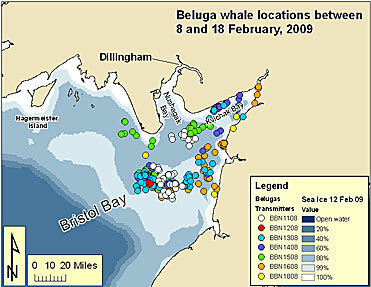 Samples are collected from belugas captured for tagging (e.g. blood, swabs, skin, blubber, feces, cultures). Information from these samples may be used to compare with Cook Inlet belugas. Differences in the health assessment parameters may provide a clue to the Cook Inlet population’s failure to grow. This baseline health assessment can be used to compare to Bristol Bay belugas in the future to see if changes in the environment due to climate change or industrial activities affect belugas. The crew for this study includes veterinarians from Anchorage and, the SeaLife Center, researchers from Seattle, Alaska Pacific University, and from aquaria in Connecticut (Mystic Aquarium) and Georgia. Instrumental to the crew due to their local knowledge of belugas, the area, as well as their boat skills are Ben Tinker, Fred Bartman, and Ray Andrew (Aleknagik Traditional Council members); Albert Roehl, Jr., Tom Olson, Bernie Lopez, and Tom Bavilla, Jr. (Cuyrung Tribal Council members). 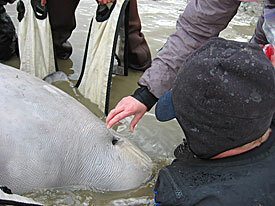 A genetic capture-recapture study is using DNA from skin to identify individual belugas. Skin is collected from free-ranging belugas annually using a pole with a biopsy tip on the end. Depending upon the number of belugas that are captured (sampled once) vs. the number that are recapture (sampled more than once) we can get an estimate of how many belugas are in the population. We have been collecting skin biopsies on the Kvichak side since 2004 and have collected ~300 biopsies. 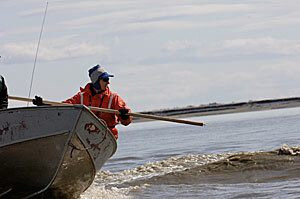 The experienced beluga crew members Nick Apokedak and Gus Tallekpalek are members of the Levelock Village Council. Collaborators: These studies are approved by and done in cooperation with the Bristol Bay Native Association, Bristol Bay Marine Mammal Council. Other cooperators include the Alaska Beluga Whale Committee, National Marine Fisheries Service, National Marine Mammal Laboratory, U.S. Fish and Wildlife Service (Togiak Refuge), and the Alaska Department of Fish and Game. All capture, handing, sampling, biopsying and tagging of belugas are conducted as permitted by NMFS Marine Mammal Research Permit No. 782-1719 and each whale is handled carefully to minimize the risk of harm.